If you recently sat through FXX’s society-destroying Simpsons marathon and have found it difficult to close your eyes without seeing yellow-skinned cartoon figures dance across your field of vision, this may provide a way to keep your buzz going. 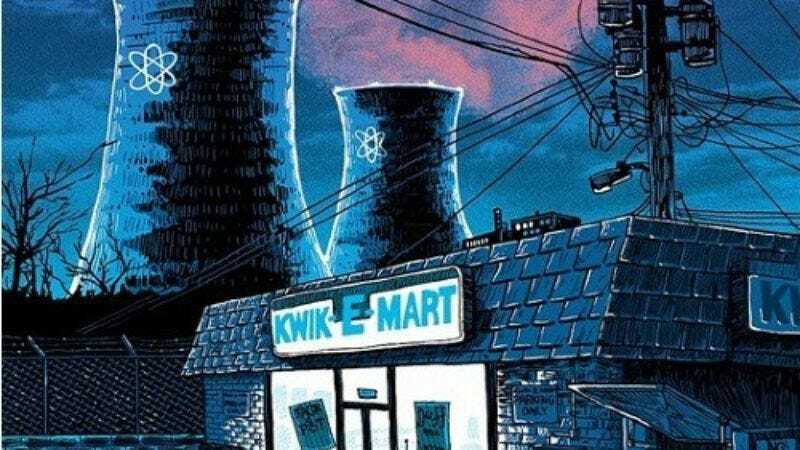 Artist Tim Doyle has produced a series of evocative, moody illustrations featuring locations from around The Simpsons’ Springfield as seen at night. Doyle, who seems to specialize in producing artwork on nerdy topics, also illustrated locations from shows like Futurama, Arrested Development, and Seinfeld, all of which are worth a look. These illustrations originally appeared as a part of Doyle’s UnReal Estate series, which first went on display in San Francisco back in 2012. For whatever reason, the Simpsons stuff has been kicking around different blogs over the past couple of days, experiencing a renewed life that the Internet, in her caprice, tends to grant from time to time. They are now yours, to do with them what you will.